The fact is no antivirus will ever achieve 100% detection with 0 false positive. Even if it does, it won’t maintain at that perfect score in the next test. Therefore you should not fully trust your antivirus but use it only as a reference. One good example is a Remote Administration Tool such as DarkComet encrypted to bypass antivirus detection. I am glad that some of you found and clean the DarkComet infection from your computer using the DarkComet RAT Remover tool when your antivirus failed to detect it in the first place. So if your antivirus says that your computer is clean, don’t think that your computer is definitely free from any malware. It is always better to play safe by using a password manager or a keystroke encryption software to prevent from any possible keylogger capturing what you type on your keyboard. Another way to increase the detection rate of malware on your computer is to scan with other antivirus engine. For example, if you have Kaspersky Anti-Virus installed on your computer, you should be using a different brand of antivirus engine to scan instead of using the standalone Kaspersky Virus Removal Tool because both Kaspersky Anti-Virus and Kaspersky Virus Removal Tool uses the same virus definition and scanning technology. Obviously you are going to get the same results. One suggestion is to use the free Sophos Virus Removal Tool that works alongside your existing antivirus. The Sophos Virus Removal tool is capable of scanning memory, including system memory on 32-bit Windows, registry, all local hard drives and offers to remove when any infection (viruses, spyware, rootkits, fake antivirus) is found. Sophos Virus Removal Tool is similar to Kaspersky Virus Removal Tool where it does not provide real time protection on your Windows computer which is why it will work even if you already have an antivirus software installed. Sophos Virus Removal Tool requires installation and the setup file is at 82.7MB in size. After installation, all you need to do is click on the Start scanning button. When an infection is found, you can click on the Details button to view the infected items and followed by clicking the Start cleanup button to remove the threats. Below is a video demo on how Sophos Virus Removal Tool scan and remove a malware that I’ve infected on my test machine. The Sophos Virus Removal Tool creates a log file in the application data or program data folder, depending on the version of Windows that your computer is running. You can find the log file (SophosVirusRemovalTool.log) from the following path: %ALLUSERSPROFILE%\Sophos\Sophos Virus Removal Tool\Logs\. It also comes with command line support that requires UAC elevation by running the SVRTcli.exe file from C:\Program Files\Sophos\Sophos Virus Removal Tool\ folder. There are several command-line options that can be passed to the command-line tool such as -yes to prevent from asking for confirmation before cleanup, -reboot to automatically restart the computer if required for cleanup, -uninstall to remove the tool after scan and cleanup is complete. You can specify the -help option to display the text help for more command line options. Sophos Virus Removal Tool doesn’t come with a self auto update feature so you will need to download from the official link below when you need an updated version to scan on a machine that you suspect to have a virus infection. 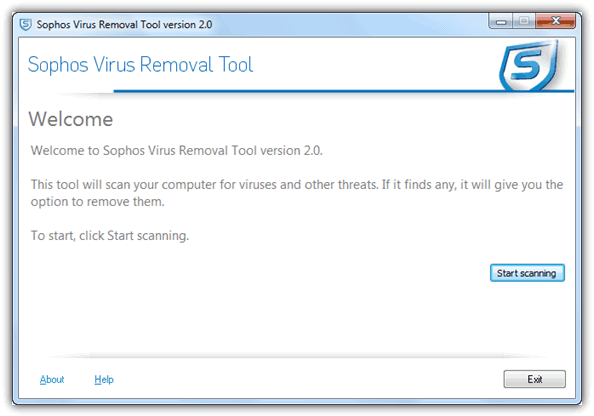 Sophos Virus Removal Tool is compatible with Windows XP SP2, Vista or 7. Hmmm ! dont know about Sophos, but “Comodo Cleaning Essentials” is worth trying. Its PORTABLE, FREE and comes with KILL SWITCH (SCANS RUNNING PROCESSES ONLINE, SHOWS INTERNET ACTIVITY OF APPS ETC). After installed, a message appears saying “THIS TOOL IS OUT OF DATE… DOWNLOAD THE LATEST VERSION” on the screenshot above. Clicking the link provided just takes you to the same Sophos download page and the same 83.1MB installer. Strange. You have my vote Raymond! PS: You may need to untick automatic clean for Norman. You don’t want Norman to “clean” all what it thinks to be malware. — Good, common sense advice, Raymond. And, so obvious that I’m embarrassed that you had to remind me. :-) Of course, you have my vote for Fave Tech Head. — The Social Bar is still floating around aimlessly on my Win7 – IE9. Any fix in sight? @la : The download has to include a complete database of malware signatures, ergo it’s not-so-large size. Just delete it when finished. i hope they can minimize the size of this apps. I’ll pass on this. I’ll wait til the apps is small.